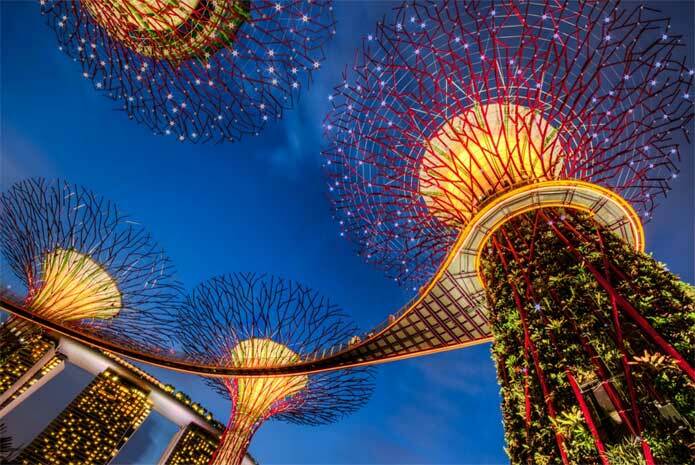 Here is a brief about some of the main attractions at gardens by the bay and some other interesting facts which will make you want to visit this versatile yet beautiful place. Gardens by the bay is a widespread lavish garden built in the south of Singapore which is focused on improving the natural flora and fauna of the lion city. 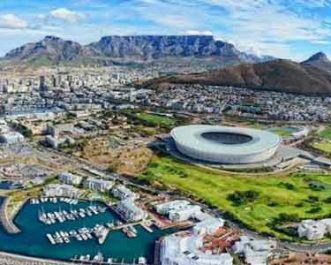 There are three gardens in total which include cooled conservatories, dining and events spaces, lakes, waterways, ariel bridges, including the showpiece super trees covered all in plants and measuring a height of up to 50 meters. Before planning a Singapore tour package you might want as well collect some background information about this place to enjoy your experience to the fullest. 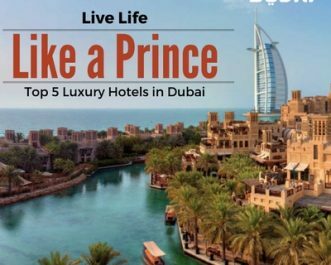 So here are a few great things you will love to know about this place before you want to visit. As soon as you enter the flower dome you will find a sudden change in the atmosphere, which is due to the intelligently replicated Mediterranean climate which prevails in Africa. 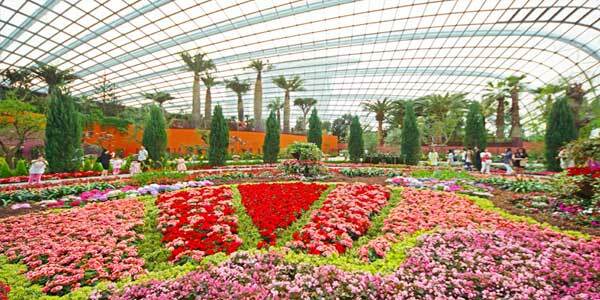 The Flower Dome is full of bottle palm trees and colorful flowers which serve as a pure delight to the visitor’s eyes. 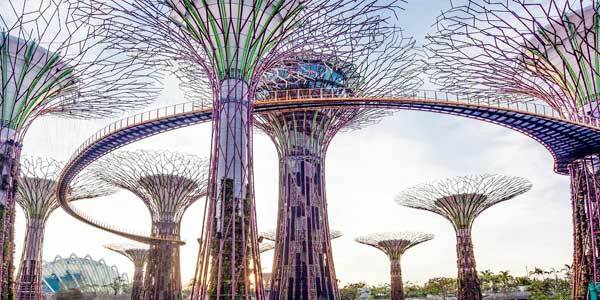 The Supertree Grove consist of super tall trees which are approx 25-50 meters tall. These trees provide the much needed shade to its day-time tourists and are also a great spot to get a picture clicked. During the night time the scene completely changes as these trees illuminate with lights decorate on them. These trees serve as a appropriate venue for various events as well. Planning a perfect Singapore Thailand Malaysia tour??? Read this. Singapore trip is meant for you to come along with your kids due to the variety of children friendly places in the city. 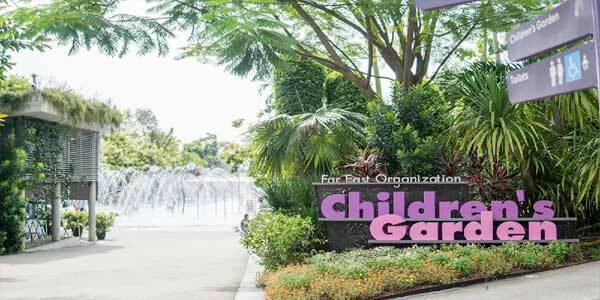 A similar dedicated corner lies at the gardens by the bay which is specifically designed for children within the age of 1-12 years. The Children’s Garden consists of trampolines, hanging bridges, balancing beams and a lot more kid friendly attractions where you can simply drop off your kids while you explore other segments. It is hard to match the view and the experience to walk on the 22-meter-tall and unbelievably beautiful Supertree skywalks. The OCBC Skyway basically connects one super tree to another one. At these height visitors are not only surrounded by exceptionally beautiful Garden but also the vistas of the Marina Bay. 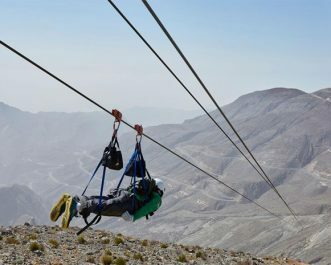 The 128 meter long aerial walk is one experience which you must not miss. A mysterious world veiled in mist; the Cloud Forest is a 35-metre tall mountain covered in lush vegetation shrouding the world’s tallest indoor waterfall. With plant life from tropical highlands up to 2,000-metres above sea level, you’ll enjoy learning about unique biodiversity and geology of cloud forests and the environmental threats they face within the nine unique zones of this Conservatory. The Gardens by the Bay is a collection of 3 public gardens initially started under National Parks Board (NParks) but soon grew out to be an independent managed organization. One of the most interesting Gardens by the Bay facts is that it is home to 2000 exotic species of over 7,00,000 natural plants on display for the visitors. 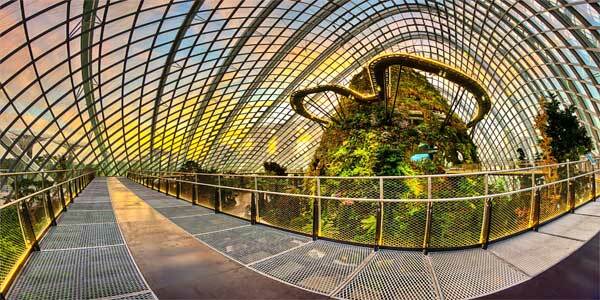 In order to reduce energy, cost inside the domes, the underground chilled water pipes are used. These water pipes are cooled by the energy generated from burning the detritus of the plants. The process reduces the energy consumption by the domes up to 30%. During the construction of the garden, a research facility costing a whopping $7 million dollar was set up to study the most efficient methods of blooming the non-native flowers. 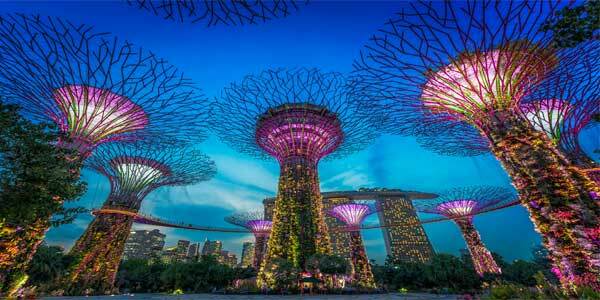 Keep Flamingo Transworld posted and get complete details of the Singapore Tour Package.